Admittedly, after visiting 10 winery tables and tasting more than 55 wines, my palate was a little overwhelmed and many of the wines were starting to taste the same. At this point, I mostly stopped making detailed notes because I felt like all of my notes sounded the same. With that caveat, the wine from Cooper Vineyards made a particularly strong impression. They had 10 wines available, 3 of which really stood out. I only ended up buying one bottle at the festival (the 2008 Petit Verdot), but I ended up ordering several glasses of the 2008 Reserve Norton while at Harry’s Tap Room in Pentagon City for happy hour. 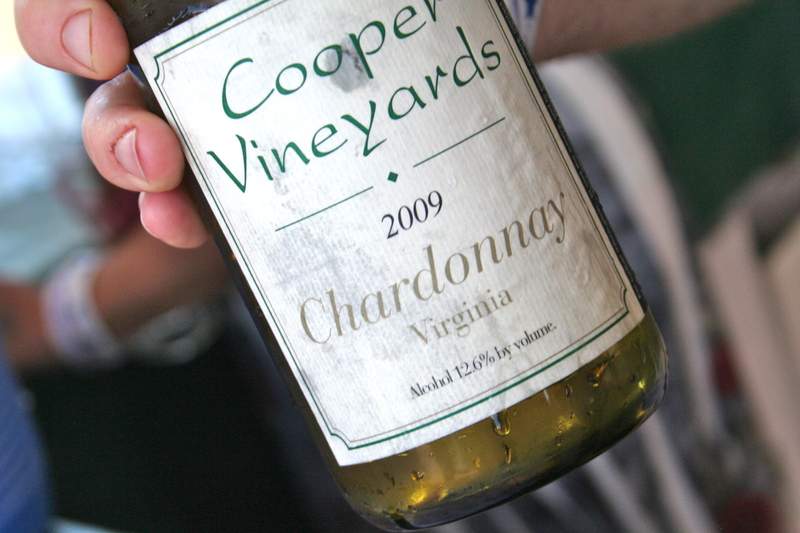 Cooper Vineyards is located in Central Virginia, midway between Richmond and Charlottesville. 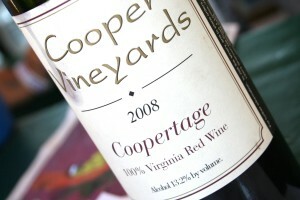 2008 Cooper Vineyards Petit Verdot ($21)—a little different; very enjoyable. 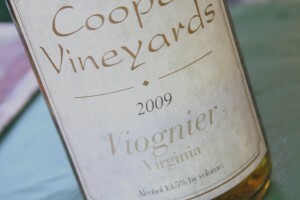 2008 Cooper Vineyards Reserve Norton ($23)—young and fruity; medium, smooth body. Noche ($18)—Chocolate wine, which Cooper is well-known for; different and worth tasting, but not a wine a could drink much of. 2008 Coopertage ($24)—43% Cabernet Sauvignon, 40% Merlot, and 17% Petit Verdot grapes; dark berries, vanilla, spices, and a hint of meat. Rhapsody ($12)—sweet white wine; pineapple and honeysuckle. Vida ($21)—Virginia “ice wine;” very sweet; stone fruits. Sweet Louisa ($12) —sweet red wine; tasted like grape Kool-Aid. Sangria (3 for $33)—overly sweet and not very good. After visiting the Cooper Vineyards table, some members of the group started to head home. 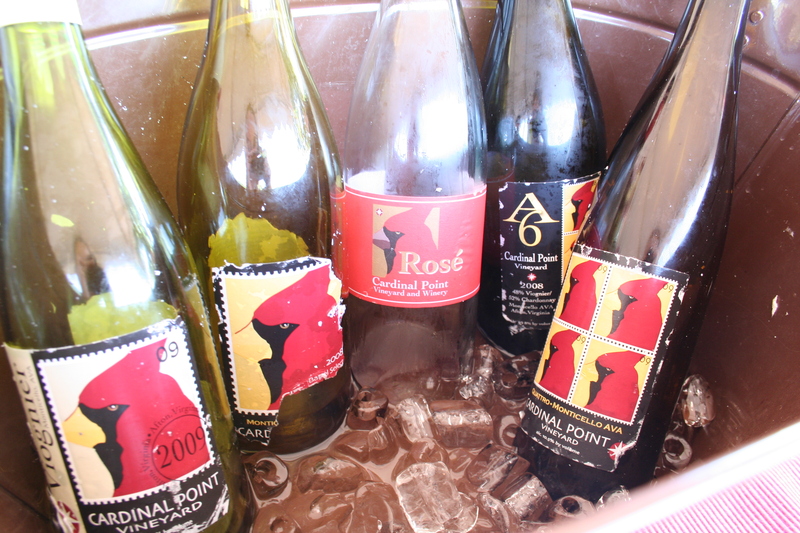 So, we said our good-byes before heading over to the Cardinal Point Vineyard and Winery table. 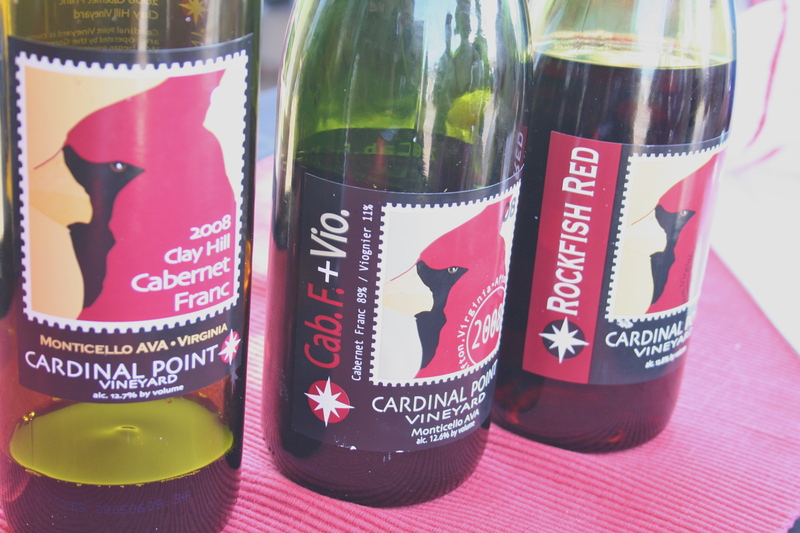 I had hoped to buy a bottle of the 2009 Rosé, which was made from Cabernet Franc grapes, and of the 2008 Clay Hill Cabernet Franc, but by the time our group made it to the Cardinal Point table, they were sold out of both. 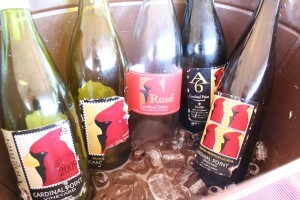 One of the women I was with did buy a bottle of the 2009 Rockfish Red, though. 2009 Clay Hill Cabernet Franc ($20)—big, flavorful wine. 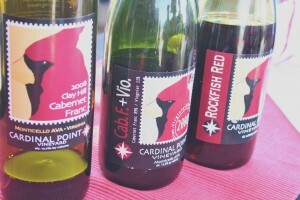 2008 Cardinal Point Cabernet Franc & Viognier blend ($18)—very nice; great acidity, good body. 2009 Quattro ($17)—intriguing blend of grapes, but just ok.
As we left Cardinal Point’s table, we lost a few more members of our group, so it was only the three of us who took the Washington Wine Academy’s shuttle from Vienna metro station left. 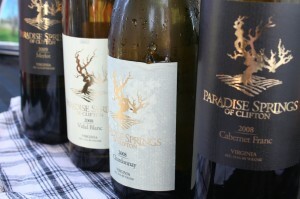 There was one winery that I wanted to taste before leave, simply because I receive regular emails from them, but have never tasted their wines—Paradise Springs Winery. Paradise Springs is one of the closest wineries to DC, and, to be honest, the guy who was pouring for them knew very little about the wine and was more interested in talking with his friend than in telling us about the wines. All in all, they were all ok wines, but none of them really stood out and I left the table slightly disappointed. Once the three of us tasted the four Paradise Springs wines, we decided it was time for another small break and some snacks before trying our last winery. For our last tasting, we ended up at Château Morrisette because, admittedly, the dogs on the labels were calling our names. Normally, I’m not swayed by critter wines, and our experience with the Château Morrisette wines hasn’t changed my approach. When we arrived at the table, the woman pouring the wines was very brisk with us, making it clear that she only was pouring the white and sweet wines. My friends and I looked at each other for a moment and, without hesitation, we all agreed that those selections were fine. I proceeded to ask our pourer for a tasting sheet so I could take notes, and she nastily handed me a wine-stained, note-filled sheet that someone else clearly used before me. When I asked for a clean sheet, with a bit of attitude, she told me she didn’t have any. Clearly, we were not off to a good start. At this point, I was tempted to walk away from the table without even trying the wines, but since I was there with other people and wasn’t sure if it was just some end-of-the-day crankiness on my part, I let it slide and started tasting. Well, things continued to go down hill, particularly after I saw a pile of clean, unused tasting sheets that I grabbed and started to make notes on. The woman was not interested in answering my questions about the wines, not willing to deviate from her script, and was all-around unpleasant and unhelpful. When we left the table, my friends confirmed that she was being very unpleasant and agreed that we probably should have left right away. Oh, well. The wines themselves were a disappointing way to end the day. 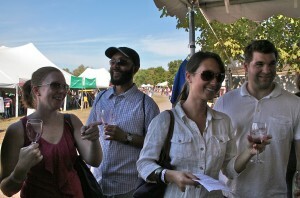 For the most part, they lacked personality, and the sweet wines were overly sweet and devoid of typical wine flavors. 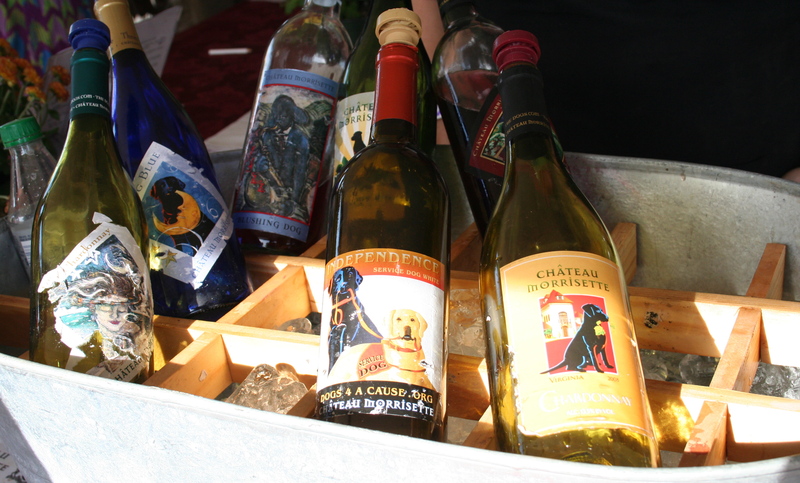 As a final surprise, in researching the winery for this blog post, I discovered Château Morrisette actually charged more money for wine purchased at the festival than for wine purchased online. Most of the wineries offered a significant discount on the wines they sold at the festival, although some simply sold the wines at their suggested retail price. Therefore, you can imagine my surprise when I discovered that buying at the festival would have been more expensive. The prices beloware the prices that were listed at the festival. After finishing up at our last tasting table, the three of us shuttle-riders headed to the designated shuttle meeting spot. We were given a bottle of water for the ride and made it back to the Vienna metro station with no hassles. All in all, it was a wonderful day of tasting Virginia wines with a great group of friends. Dezel, Leighann, Jacquie, Chris, & Tim–thanks for joining me. It was the perfect way to spend a Sunday afternoon. For those of you who missed the festival, put it on your calendar for next year! 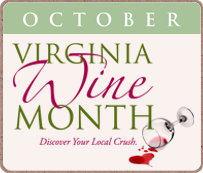 There is a nice representation of wines from all over Virginia, it’s easy to get to, and it’s a lot of fun. *See Part 1 for reviews of Rosemont Vineyards and Winery, Delfosse Vineyards and Winery, and Kluge Estate Winery and Vineyard. *See Part 2 for reviews of Tarara Winery, Davis Valley Winery, Wintergreen Winery, and Mountfair Vineyards. *See Part 3 for reviews of Veritas Vineyard and Winery, Villa Appalaccia Winery, and Unicorn Winery.